Legacy contributions have shaped Thomas Balch Library from the beginning. Edwin Swift Balch and Thomas Willing Balch of Philadelphia, donated funds to have a library built as a memorial to their father in Leesburg, the town of his birth. Citizens of the town came forward with additional funding to purchase a suitable plot of land and the completed library was dedicated on May 22, 1922. The Messrs. Balch later donated their father’s collection of books, which are still held as part of the Library’s rare books collection. Down through the years, many citizens have remained constant in their support of Thomas Balch Library and always respond in times of need. You can be part of this long tradition by including a bequest in your Will. There may be significant estate tax benefits if you include a bequest to Friends of Thomas Balch Library, Inc. When giving through the Friends, you are assured that one hundred percent of your gift will go for the benefit of Thomas Balch Library. Click here to access the Bequest and Endowment form. In 2015, the Friends succeeded in establishing the Thomas Balch Library Endowment Foundation (TBLEF), which can directly receive funds to support this invaluable resource. The Foundation grew from a generous bequest of more than $600,000 made by the late Virginia Bowie, a longtime volunteer, to Thomas Balch Library. Her contribution set in motion a process that resulted in the separation of gifts to the Library from the capital and operational budget of the Town of Leesburg, which owns the Library. The Thomas Balch Library Endowment Foundation is now officially a vehicle for those who wish to provide specific funding for the Library in perpetuity to do so. Brass leaves for Friends of Thomas Balch Library's "Tree of History" recognize contributions. The Foundation has five board members: Friends board members Ronald Rust and the Honorable Thomas Horne; Thomas Balch Library Advisory Commission member James Hershman, attorney Keith Troxell, and Library Director Alexandra Gressitt. 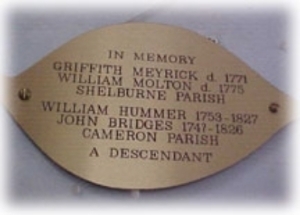 The Friends offers several other ways in which individuals, families, businesses, and organizations may permanently honor or memorialize individuals or ancestors at Thomas Balch Library, including the purchase of brass leaves for the Library's Tree of History and/or bricks for the B. Powell and Agnes Harrison Memorial Garden. Click here for a form to order your leaf or brick. To learn more about our giving opportunities, click here to use our secure "Contact Us" form or feel free to leave us a voicemail at 540-579-2825 and someone will call you back.